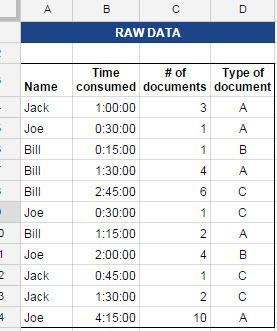 I have a table in wich raw data is entered manually, with info about clients and the requests they made. And then I have this table in which I'm trying to analyze a bit the raw data (# of requests per client, time consumed, etc). Also I need the analysis table to auto update each time a new entry is made in the raw data table. How to analyze a time tracking sheet with Google Sheets?